Volunteers Needed Throughout the World--Come Join our New Civilization, Global Touch Project - Humanity Needs Us Now! Our <Las Cruces Health Promotion Team with Elders would like to introduce and teach you to give the 15-Minute StressOut Program with Elders—a program designed to give ethical, safe, skillful, and nourishing touch with elders. Using acupressure and other skillful techniques, coordinated with the breath to balance our body, mind, emotions and spirit, is a heartfelt or empathic experience for both the giver and receiver of this partner massage. 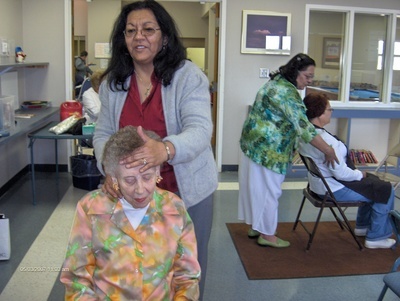 During this past year, our volunteers – seniors, NMSU social work, nursing and health science students, caregivers, in-home care workers, senior staff, and others gave over 3,800 “stressouts”(chair-like massage) in nursing homes, diabetic health clinics, day care and in-home care services. 4) Report (6)evaluations of your work. 3) An exchange of energy, love, respect, and good will knowing that you have contributed through skillful touch to help support the basic human need requirements for elders and others to live a healthy, dignified and respectful life. If you wish to be a volunteer, schedule an in-service training program in your agency/community or know of care-givers and others who may be interested in learning our ethical, safe, skillful and nourishing touch program for all populations, please let us know. 30 Sep 2007 @ 01:25 by vaxen : How exciting! Wow...way to go Jerry! Thankyou so much. a great time and our volunteers and students are feeling great about their experience. It is very hard to see so many frail elders who seem to be lonely, yet cared for. I'm not sure of the extent of the drugging that goes on in nursing homes, but I know there are guidelines that should be followed. I am waiting for a report from our state ombudsman's program as I inquired about the physical, mental, emotional and spiritual loss of so many of the residents. But, we all loved our touch and exchange of energies without a doubt. comments. Yes, these drug cocktails seem to be the standard opperating procedures for most of these nursing facilities. I was going to say "homes", but we know there are few 'home-like' resources for our elders administered by these corporations. Recently, the NY Times pointed out that these greedy corporations are cutting their staff to make more money. Articles in this series are examining how businesses and investors seek to profit from the soaring number of older Americans, in ways helpful and harmful. Residents fared less well. Over three years, 15 at Habana died from what their families contend was negligent care in lawsuits filed in state court. Regulators repeatedly warned the home that staff levels were below mandatory minimums. When regulators visited, they found malfunctioning fire doors, unhygienic kitchens and a resident using a leg brace that was broken." “They’ve created a hellhole,” said Vivian Hewitt, who sued Habana in 2004 when her mother died after a large bedsore became infected by feces." Several years ago, I participated in Dolorus Kraeger's training on therapeutic touch (TT) and did enjoy it. However, because they do not connect physically with the body, the intervention is more subtle. I have incorpoated the awareness of the energy field while we do the "laying-on-of-hands" with our partners. As we get more touch experience, it becomes more evident and very powerful to lay our hands on the shoulders of our partners and exchange our energies. I call this the "empathic connection or relationship" as we do unify our energy and become one body, mind and spirit. Thanks for the movie recommendation--I'll look for it. I think that if the staff gave their residents a "stressout" on a regular basis they could cut back and/or reduce the meds. by volumns. We have now observed and experienced, first hand, how effective touch can be with our Elders and we are making these activities a standard operating procedure for several nursing homes and health clinics. Our city aging programs are introducing our touch projects in their newsletters and training the home-care staff in giving our "15-Minute StressOut Program" with the home-bound and in nursing facilities. Jerry: Looks wonderful. I have forwarded to a wellness associate who runs a meals on wheels program for senior as a possible add on. appreciate these international service programs as you've done such a great job with your computer project in Central America.